Gina is a tax partner in the Investment Management group of PricewaterhouseCoopers LLP and is based in New York City. She has 25 years of experience and has been a partner with PwC for 17 years. 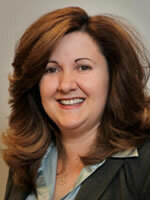 Gina specializes in the distressed debt, special opportunity, and hedge/private equity asset classes. She has experience in a wide array of strategies including equity, credit, commodities and real estate. Gina’s client base includes many of the largest and most complex alternative investment managers in the marketplace, and ranges from start-up managers to established global firms. Gina is the leader of the PWC New York Investment Management Tax Practice, with day-to-day responsibility for a team of 20 tax partners and approximately 400+ staff. Prior to this role, Gina has led the technical, quality and risk management functions for the U.S. Investment Management Practice. Gina has also served as the Firm’s Tax Diversity Leader and as a member of her U.S. Firm’s core tax and extended leadership teams. She is a national technical resource for other PwC clients and offices. Gina received her BA in Accounting and Economics from Queens College, her MS in Taxation and MBA in Finance from Fordham University. Gina is member of the Managed Funds Association, Wall Street Tax Association, New York State Society of CPAs and International Swaps and Derivatives Association.